Welcome to our gallery featuring a bevy of gorgeous G-shaped kitchen designs in an array of styles. When thinking about kitchen shape as a fundamental element of design, we imagine how the shape of the counters will drive interaction and utility in the room. There are kitchens in virtually any reasonable shape, all with different focuses. 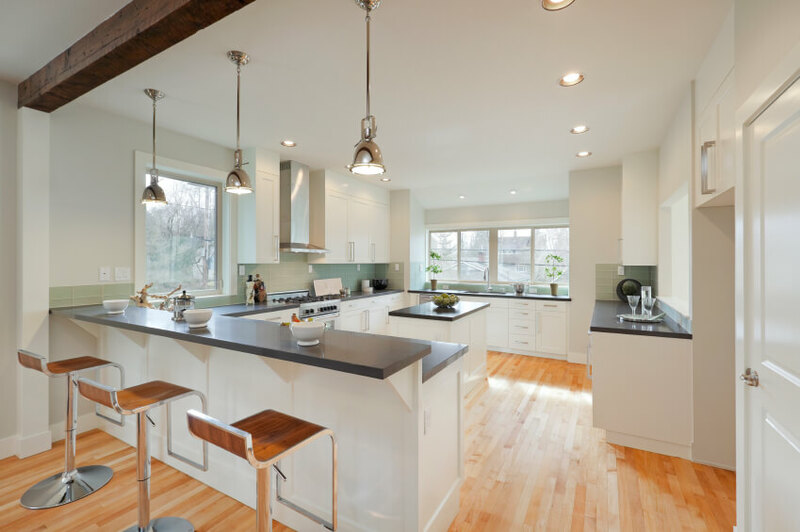 Long, slender kitchens can be great for encouraging foot traffic or emphasizing an open floor plan, when the kitchen sits centered within the home. 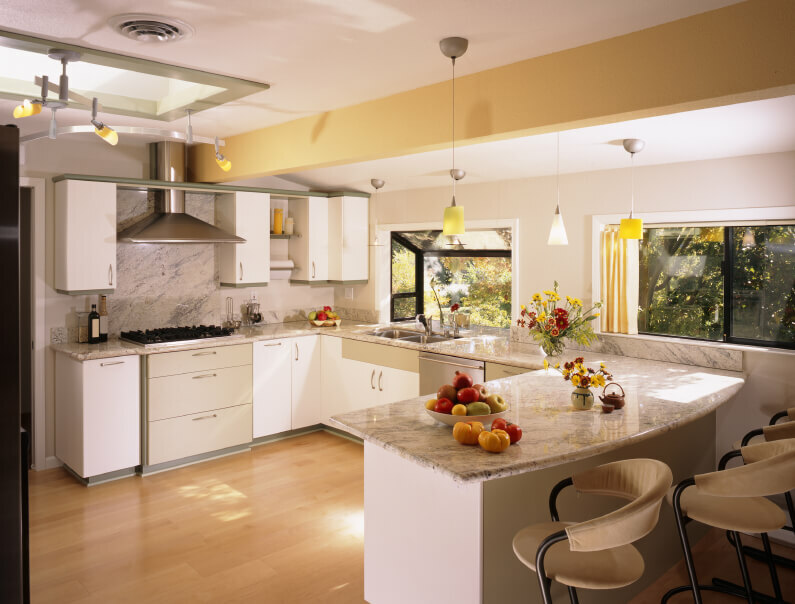 L-shaped kitchens can similarly make use of a lengthy countertop for expansive cooktop or serving space. U-shaped kitchens are perfect for rooms surrounded in windows, with an ample wrap of counter space surrounding an open floor plan. Finally, there are G-shaped kitchens. G-shaped kitchens appear in perhaps the most positively utilitarian design, offering an innovative expanse of countertop in a design that stays visually open while wrapping around the cooking space at center. Like the titular letter, it brings the comfort of a U-shape and the sharp edge of an L-shape together, offering the countertop benefits of both. The G-shaped kitchen allows for a particularly useful design element, the countertop that doubles as an in-kitchen dining station. Whether the countertop is two-tiered or a single wide layer, the dual use nature enhances both the look and feel of any kitchen, adding another dimension of interaction to the room. One reason that we find G-shaped kitchen designs so appealing is that they create a nearly perfect circle of homogenous space for the cook, while welcoming in friends and family with open countertops and space to sit and interact with the kitchen from the outside. In addition, they offer the frank functionality of a rectangular countertop, combined with the organic curve of a more circular or U-shaped kitchen. When you can approach the kitchen space, interact with those inside it, sampling food and conversation, but staying out of the way of those cooking, it’s a serious win for kitchen design. It’s also a serious win for homeowners looking to craft the perfect social cooking space. With as simple a common element as kitchen shape, we were set free to choose some of our very favorite kitchens from wildly varying styles and themes. Thus, you’ll see a veritable cornucopia of definitive personalities throughout the gallery below. 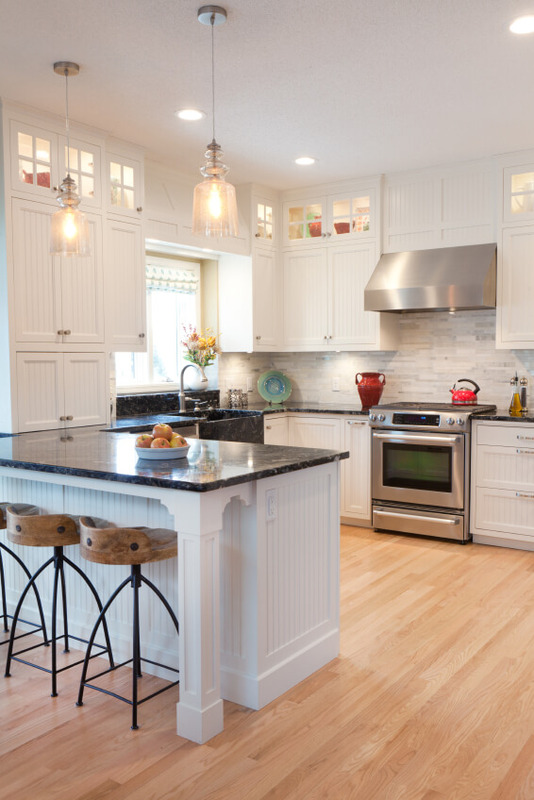 From traditional kitchen setups to ultra-modern creations, every style is represented. Some particularly striking design elements and style flourishes to look out for include rich hardwood countertops, intricate tile backsplashes, modern cabinetry solutions, and often surprising bursts of color and texture. We hope you thoroughly enjoy the range of bold and distinctive G-shaped kitchen designs we’ve shared below. This thoroughly modern kitchen features rich dark wood countertops and glass-door cabinetry, surrounding a space with light hardwood flooring. Stainless steel appliances spike the natural palette, with a grand hood vent hanging above the countertop-mounted range. The visual appeal is taken up a notch by white cabinetry facades, free of hardware and clutter. Here’s a mostly white kitchen boasting the high contrast and warming look of rich hardwood countertops wrapping the outer edge. A sleek light blue backsplash adds a covert element of color to the mix. Throughout, spikes of stainless steel punctuate the mild tones for a positively contemporary feel. This sprawling kitchen is packed with detailed and useful elements, from the ample shelving to the large countertops in both sleek white and rich wood. The design allows for the white cabinetry to be spaced well, offering abundant space for movement. The central hardwood countertop brings a wealth of workable space and doubles as an in-kitchen dining table. The vast array of large windows creeping up to the ceiling overhang illuminate this kitchen with ample sunlight. 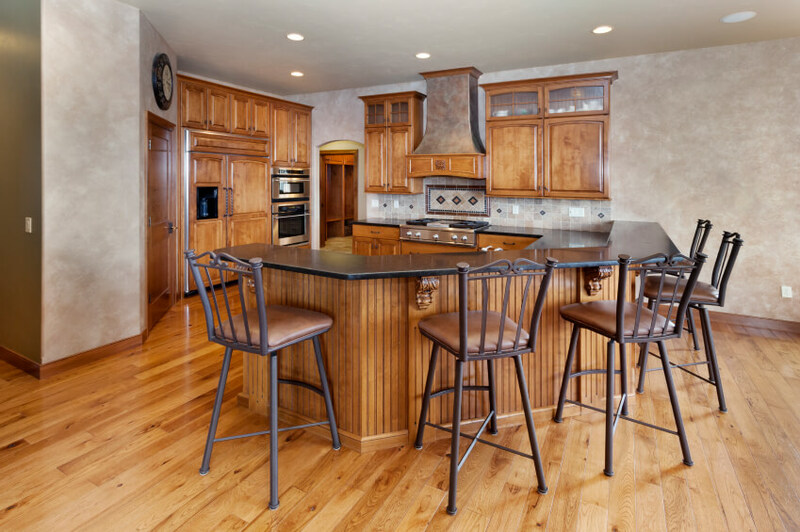 The granite countertops wrap over natural wood cabinetry, with rich hardwood flooring connecting the expanse. You’ll notice that even the large windows and doors are framed in a light natural wood. Light hardwood flooring matches the natural wood tone of the cabinetry and dining chairs in this open-plan space. The kitchen is defined by its wrap of dark glossy countertop, providing room for a trio of bar stools. The upper cabinetry stops short of the ceiling, allowing for an elegant layer of artwork and vintage pieces to stand on display. The pristine white cabinetry in this kitchen contrasts sharply with black granite countertops, wrapping all around a bright space grounded by hardwood flooring. A light tile backsplash adds texture without disrupting the color palette. The bar stools standing at the countertop add a splash of rustic charm, with dark metal frames and carved wood seats. 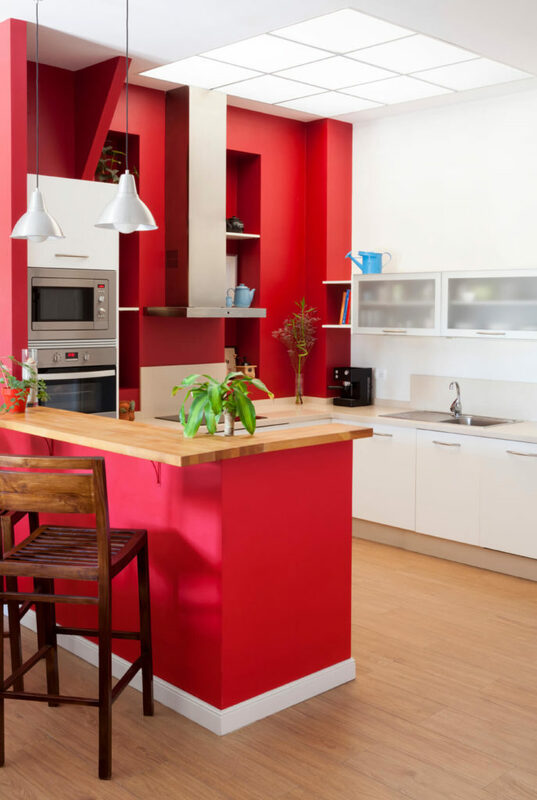 The obvious centerpiece to this kitchen’s style is the bold red paint adorning the walls, in direct contrast with white cabinetry and natural hardwood flooring. The raised wood countertop in the foreground acts as a perfect dining space while defining the edge of the kitchen itself. 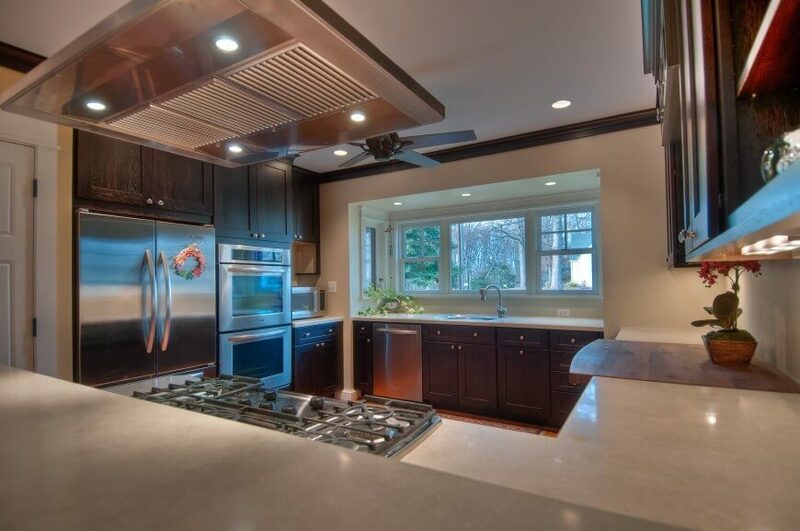 Contemporary stainless steel appliances enhance the modern look. Here’s another cozy kitchen with contrasting colors: both natural wood and glossy white cabinetry feature prominently, while a unique pair of cylindrical stainless steel lighting elements float in front of a dark copper wall. The intricate floor design shows as much attention was given below as went above, with the grand skylight at center. 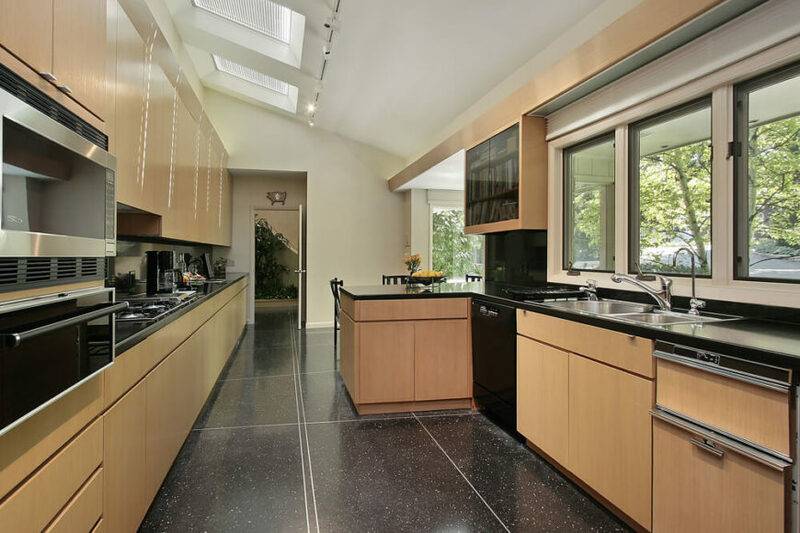 In a lengthy and deeply contemporary kitchen, speckled black flooring and glossy black countertops contrast with the white walls and open, sunlit space. 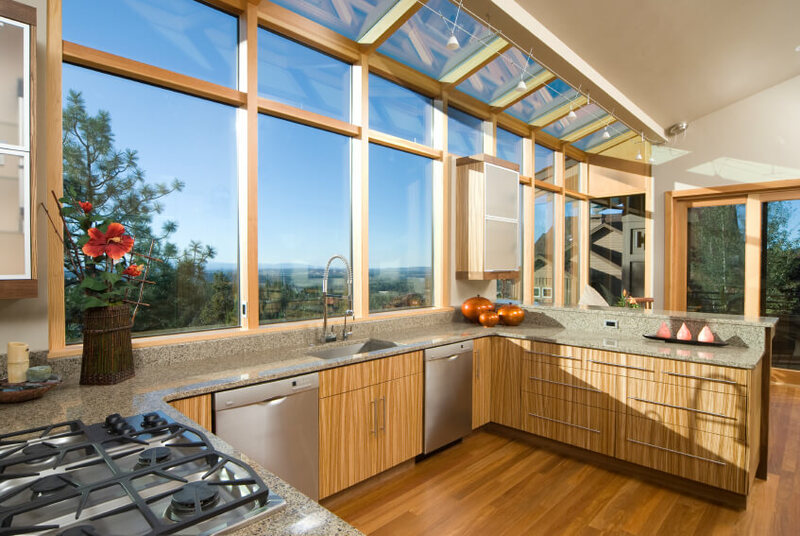 Natural wood cabinetry surrounds the area, sunlit through abundant windows and skylights. A discreet bookshelf is built into the right wall, with smoked glass cabinet doors. 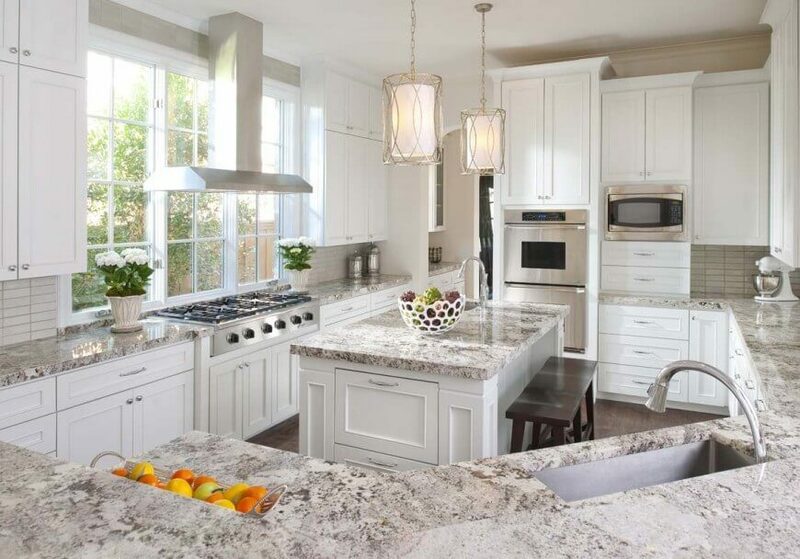 In a kitchen flush with elegant style, granite countertops adorn nearly every horizontal surface. 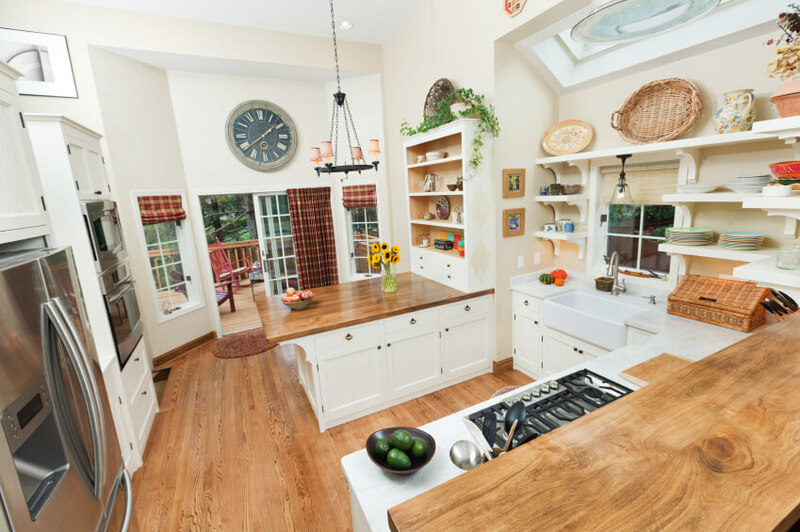 The large island is complemented by surrounding white cabinetry and a lengthy wraparound countertop. 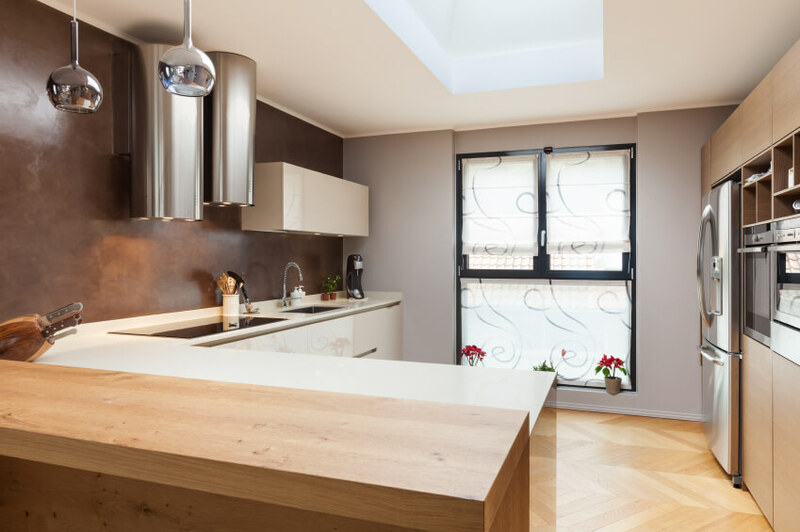 Above the large stainless steel range, an immense set of windows fills the entire kitchen with sunlight. See more of this home here. Designed by Ellen Grasso & Sons. The G-shaped countertops clearly define this cozy kitchen, stuffed with rich wood cabinetry and white marble countertops. A large cutting board segment is built into the counter at right, complementing the built-in stainless steel range at left. See more of this home here. Designed by Ballard + Mensua Architecture. Seen from a new angle, we can appreciate the raised tier at right, providing in-kitchen dining for a pair of leather upholstered bar stools. The warm hardwood flooring and large bay window add warmth to the space, while sets of open shelving offer a space for artful nicknacks. This richly appointed and luxuriously rustic kitchen wraps its natural wood cabinetry with bold marble countertops and nearly matching tile backsplash. The curved and raised tier in the foreground offers ample space for numerous in-kitchen diners. In a splash of inspired joy, the bar stools are framed with tree branch-look metal, aiding the homespun atmosphere. 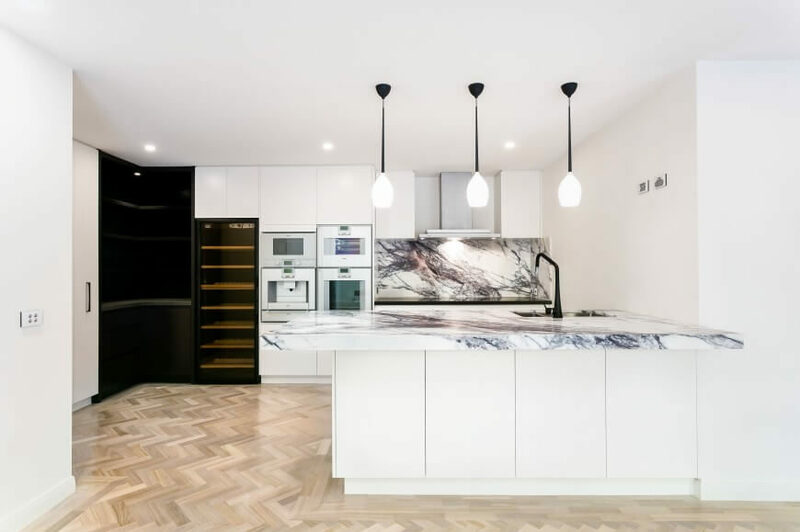 Pristine white, hardware-less cabinetry defines this ultra-modern kitchen, with a splash of high contrast provided by black shelving in the corner. Thick slab marble countertops and a matching backsplash boost the visual appeal. The plumbing, far countertop with modern range, and trio of pendant lights all echo the contrast in their black framing. 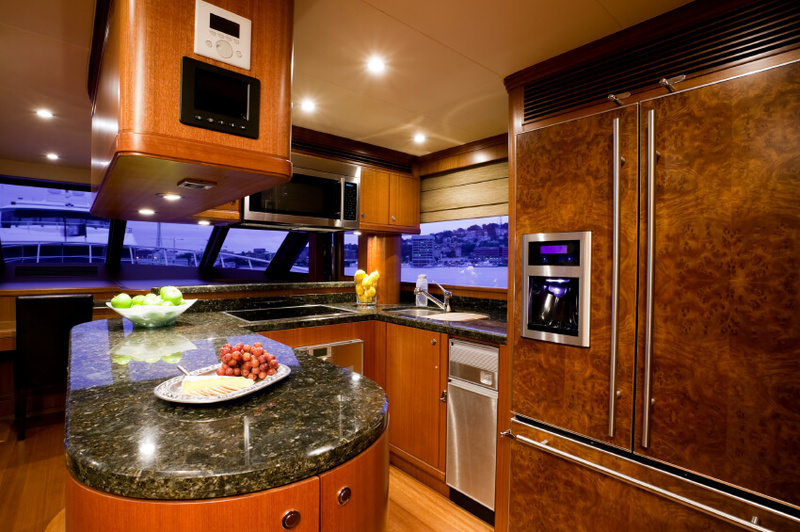 Even on a boat, you can enjoy the luxury of a G-shaped kitchen. This design necessarily packs a lot into a small space, with dark granite countertops and rich wood cabinetry boasting a carefully considered sense of contrast. 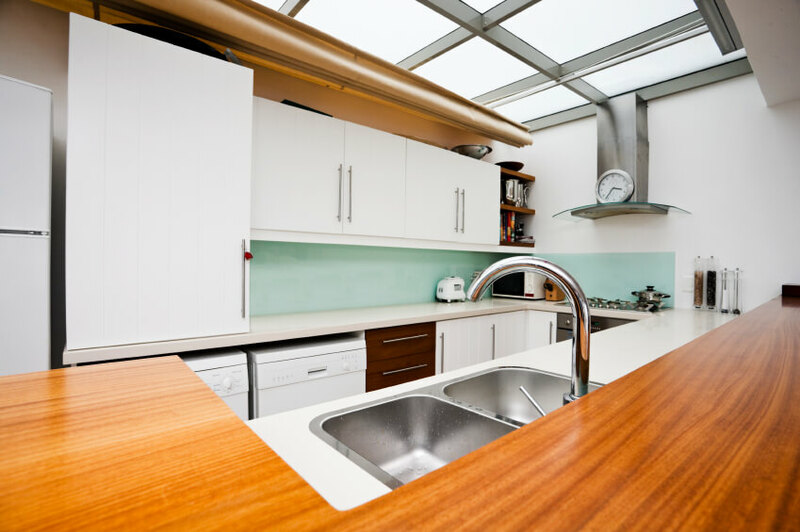 With everything fit so tightly together, it’s amazing to see the variety of appliances and useful countertop space. 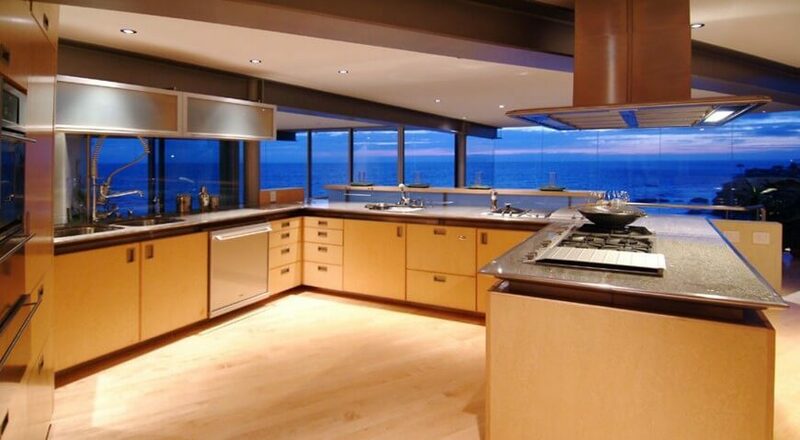 This expansive, open plan kitchen enjoys broad views of the surrounding ocean via wraparound glazing, while steel-edged granite countertops stand in contrast to light wood cabinetry. The G-shaped configuration allows for a grand open space at center, allowing multiple cooks to share the kitchen. 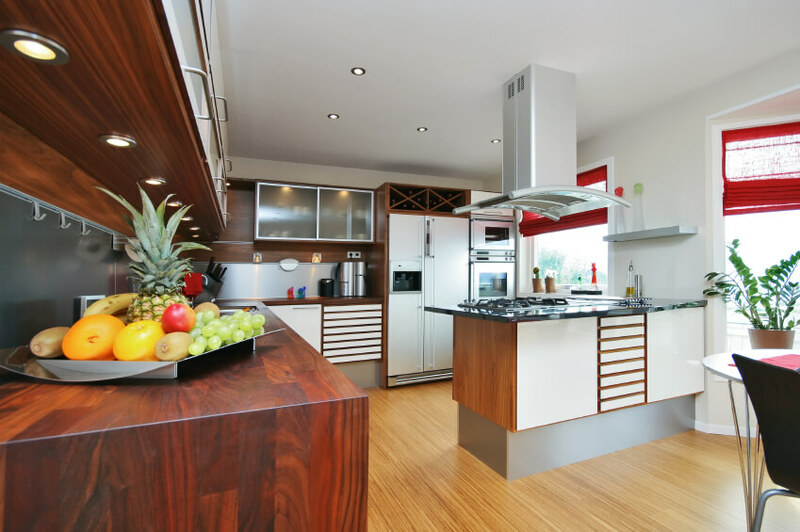 Stainless steel appliances and upper-level cupboards boost the modern appeal. See more of this home here. Designed by McClean Design. White cabinetry contrasts with dark grey countertops in this broad kitchen, boasting an array of working surfaces. A raised tier on the foreground countertop allows for in-kitchen dining with a trio of modern bar stools. The light sea foam green tile backsplash adds a whisper of color to the room. In an elegant room defined by modern shapes and traditional materials, we see rich wood cabinetry and countertops crafted into a sharply angled G-shape. Large windows open to allow a direct connection with the courtyard and adjacent pool. 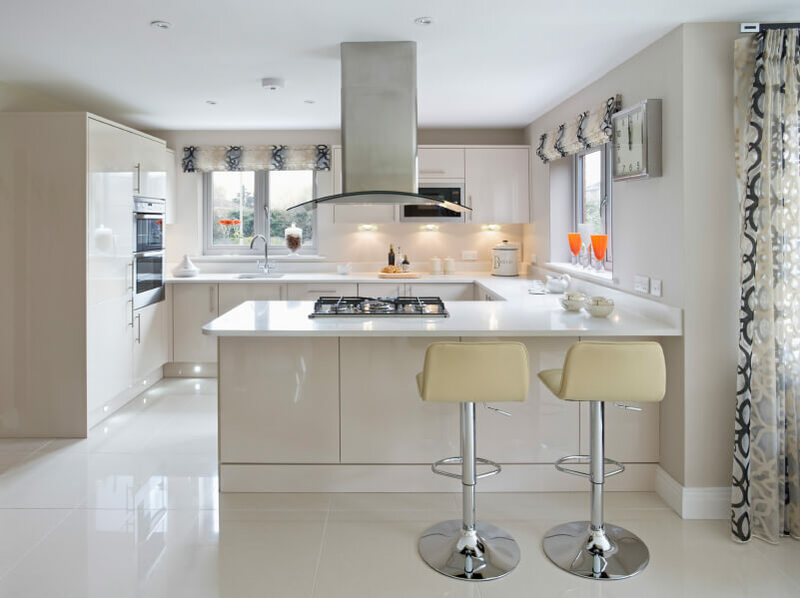 The central nature of this kitchen’s placement within the home allows the design to carry extra heft, defining the space within a large open plan. See more of this home here. Designed by Marmol Radziner. Sleek, modern minimalism informs the look of this kitchen, with expanses of glossy white in every direction. The large format tile flooring pairs well with white countertops and cabinetry, providing space for a pair of bar stools at the extended countertop in the foreground. Elegantly textured but transparent drapes add a healthy dose of visual complexity to the monolithic room. 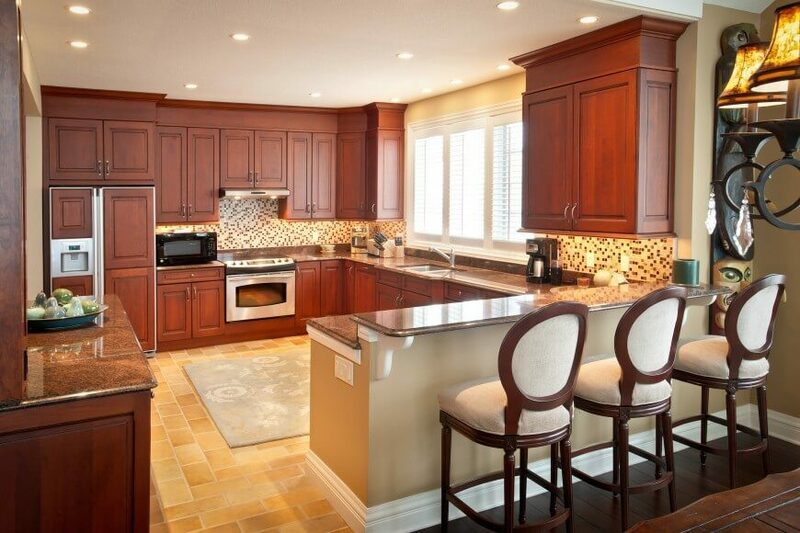 Traditional style informs the rich wood cabinetry and light tile flooring of this kitchen. 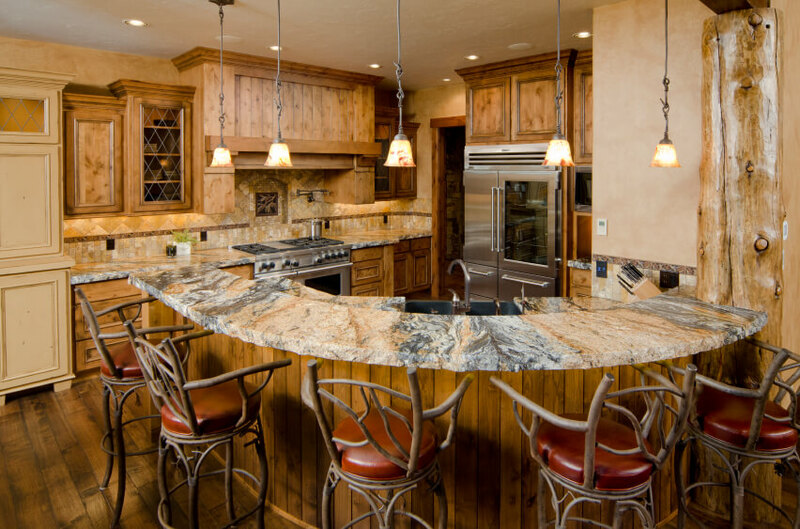 The brown granite countertops reach out toward a two-tiered wing, with raised surface for in-kitchen dining. Intricate micro-tile backsplash, sandwiched between the wood cabinetry and countertops, act as a playful counter balance to the room. See more of this home here. Designed by The Quiet Moose. Standing within a larger open-plan space, this kitchen is defined by its G-shaped countertop, wrapping around a broad space with dark countertops and plentiful space for elevated dining. 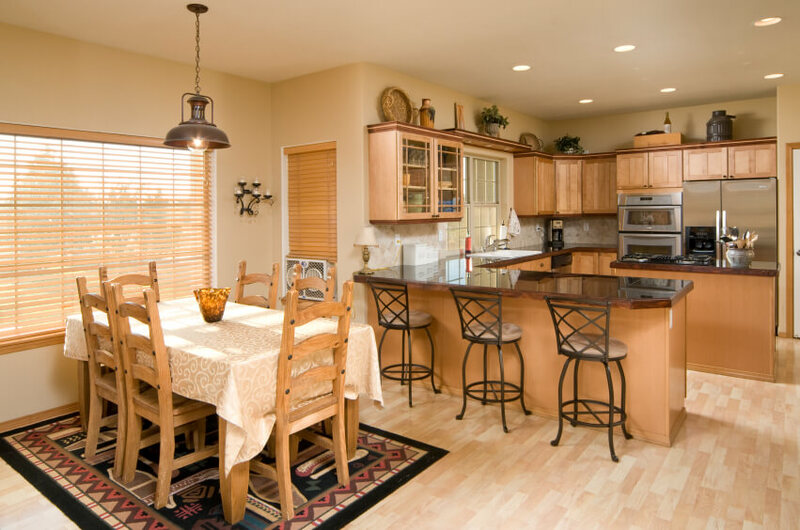 Rich traditionally styled wood cabinetry grounds the room’s presence. With the expanse of hardwood flooring beneath this space, the entire package feels coherently styled. Returning to this cozy kitchen surrounded by wraparound glazing, the G-shape of the countertop is clearly defined. 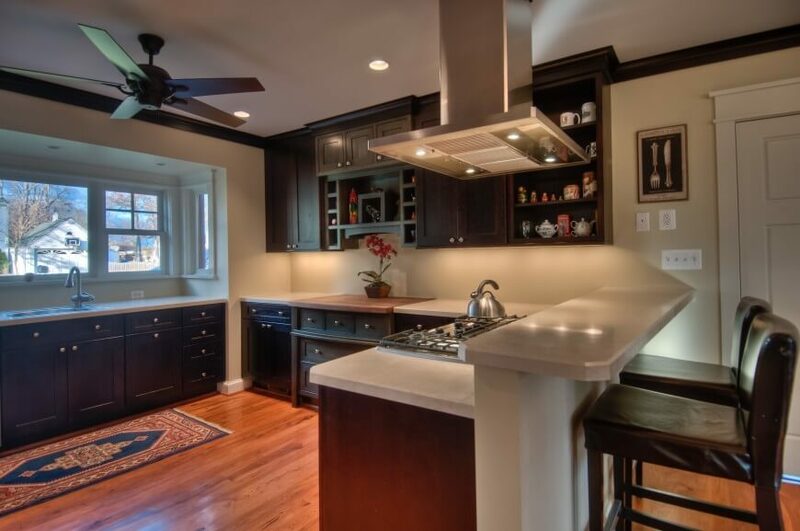 Standing across from a breakfast nook, the countertops appear in dark wood with matching cabinetry. The cupboards and countertops flanking the nook help this kitchen achieve the feel of both a galley kitchen and a G-shaped one.